Whether you’re planning on watching the U.S. Open, mourning and celebrating the life of Gene Wilder, or just sitting in traffic trying to make it to the beach, there’s a lot of news to catch up on over Labor Day weekend. Read on. “Combined properties operated by Sports Illustrated and Fox Sports brought in about 68 million unique visitors in July, which would make it the second-largest sports publisher behind ESPN, which brought in about 79 million visitors, according to digital measurement specialist comScore. In programmatic advertising it’s vital to know what kind of data you’re using and whether it’s first, second, or third party. This ClickZ article provides a good primer on the differences and advantages of each. After testing the podcast waters with “Women@Forbes”, the venerable business publication is going all in with podcast network Podcast One. We’re getting this week’s Next to Now out a little early so you can focus the rest of the week on family, friends, food, and giving thanks. This is first of all a moving story about a person in need reaching out and another person responding. But, in the context of this blog of marketing links, it’s also a reminder that serendipity in advertising can sometimes deliver results more powerfully than the acutest targeting. An eMarketer survey reveals that U.S. marketers find excessive emails are tied with wasteful meetings for the biggest thing that’s getting in the way of doing their work. No comment on their own fondness for sending emails as a successful marketing tactic. Snapchat CEO Evan Spiegel has stated that he is not in favor of hyper-targeting his users with ads, but that might have to change if he wants to make good on the promise investors saw in his company. 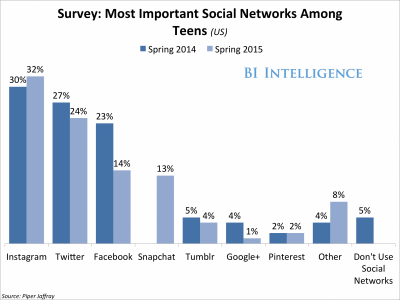 …which may be a reason there are signs that Snapchat’s loosening up its data restrictions. Streaming successful podcasts such as Serial on Pandora has a major advantage for advertisers over downloading—with streaming we can see click throughs and collect data. With downloaded podcasts, the ads have no ability to click through. If you were hoping to advertise on Serial through Pandora, however, you’ll have to wait until next year: Warner Brothers and Esurance have locked up the slots for Seasons 1 and 2. Is it a coincidence that the acronym for the Bill Simmons Podcast Network from ex-ESPN gadfly Bill Simmons is BSPN? Once the shining star of internet snarkiness, Gawker has been publically wrestling with its own identity a lot recently. Their new turn is to politics. We’ll see if the grande dame of snark can pull it off. WHAT’S BETTER FOR VIDEO ADS, FACEBOOK OR YOUTUBE? “The results showed that combining YouTube and Facebook buys is the most effective method for marketers. Reebok shared the data during Adweek’s Executive Lab, which was sponsored by Pixability, in New York on Thursday. Facebook puts that $2B purchase of Oculus Rift to work with a first look at virtual reality ads for brands such as AT&T, Nestle, Mondelez, and Samsung. ARE GIFS THE FUTURE OF ADVERTISING? You’d think IAMS marketers would have it easy: cute cat and dog .gifs all day long. Turns out they’re not just churning the content out, but thinking carefully of editing spots to work differently on different media. A cute cat video for TV needs to run differently than a cute cat video on Facebook. Same shoot, different edit.